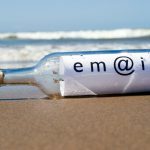 Shine at the end of your initial email correspondence with a hiring manager! Shine! End the email with something that will put a smile on the hiring manager’s face. I’ve personally seen it done only a handful of times in my past. In comedy, it’s a call back. But think about it before standup where we’ve all come to know it. Think about how they do it in writing all the time. Especially in everyday lives by people who aren’t comedians. Visualize these two guys. Gatfield and Phil. Gatfield hasn’t seen his old friend Phil in 6 years (think back in the Pioneer days). So Gatfield sends Phil a letter, “Hey bud, blah, blah, blah. Remember when Ned burned that barn down? Blah, blah, blah, Phil, your cousin Ned was way funnier than you! Anyway, come see me! urgent! Don’t worry about distance!” Phil’s thinking, “Well that’s 600 miles away! It’ll take me 3 months.” Gatfield already knew and continued with, “I got a good rig going on over here that will make you rich. Heck even Ned’s hog ham’s doing alright.” And Phil puts the letter down with a smile. It was Gatfield’s way of closing the deal. The callback. It’s a fundamental comedy rule like the rule of 3’s. Even back then you had to do some convincing on people. And you did. You made a funny at the end of the letter. You sold something. Do the same with potential employers. Be polite and courteous, yada, yada, yada (for more info on email etiquette, check this previous post: http://jobstickers.tumblr.com/post/18791717803/email-etiquette-for-job-seekers-o-keep-your), but more importantly SELL YOURSELF! You might only have this one time to get a hiring manager’s eyeballs on your resume! If they aren’t impressed with your initial email to them, if that’s the case for you, MAKE IT COUNT! And for God’s sake, spell check! Even I make that mistake sometimes and it feels pretty bad. It shows your lack of attention to detail and your inability to keep a steady pace without going in over your head. These are the things hiring managers think of when they’re on the front lines. As they should. The short end of it is that they’re responsible for the bottom line. Livelihoods…of people like cousin Ned. Anyone who’s like “Gatfield?” Dragon dictation auto-correct rules. I kept it. That might be a good screenplay name. Some Civil War General. Please contact MJW Careers for inquiry on email summary assistance among other targeting techniques in your job search!